Photo above: Jenesis with elementary school students preparing Valentine's Day cards. Every year, Valentine's Day gives people worldwide a reason to show their love for all of their friends and family. 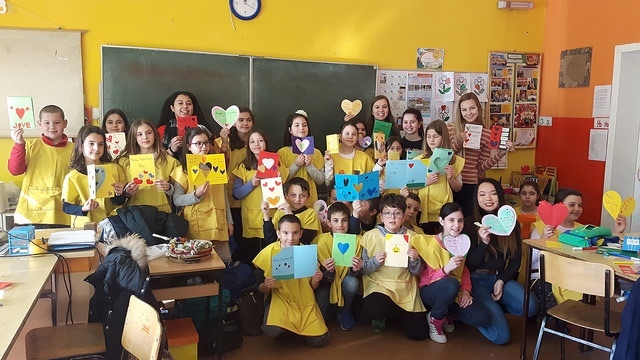 This past Valentine’s Day, the four other YES Abroad students and I had the opportunity to visit a fourth grade class in the Elementary School “Dimitar Miladinov.” There, we were able to assist the students in sharing their love for their classmates and family through making Valentine’s Day cards. When we arrived to the classroom on the morning of Valentine’s Day, the students greeted us with their biggest smiles. They were patiently awaiting our arrival, and eager to take a break from their normal art class to make Valentine’s Day cards. Seeing this excitement, we quickly divided ourselves among the tables of students and began working. I settled at a table of 5 students, and began to hand out the paper, markers, and stickers. For the next couple minutes we worked on folding our papers and cutting our stickers, meanwhile introducing ourselves. As a group, we ended up with one collective card design that included heart balloons covering the inside and outside of the card. Once everyone was satisfied with their craft’s appearance, the students had the task of deciding who exactly their cards would be for. Although they initially struggled to figure out their valentines, all of them decided to make the cards out to a friend in class. Interested in who these friends were, I asked the students to point out each of their valentines. After having a long conversation about all their friends, I helped the students write meaningful messages to them inside the card. My table began going around the classroom delivering our cards, and soon, the other groups followed. Once all the cards were distributed, we had just enough time to take one group picture with all of our work. When leaving the classroom, we saw the same smiles waving us goodbye and asking us to visit once again. 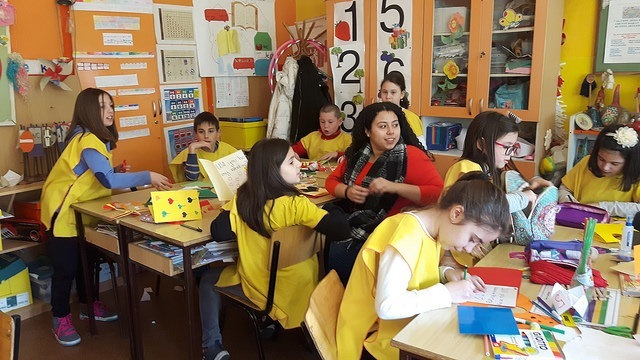 For the YES Abroad students, visits like the one with this fourth grade class, are beyond meaningful, as we have a chance to interact with the most wonderful children. They teach us all about how school works for elementary aged children in Macedonia, and allow us to practice our still-developing Macedonian language skills. Photo below: Students show off their finished products!